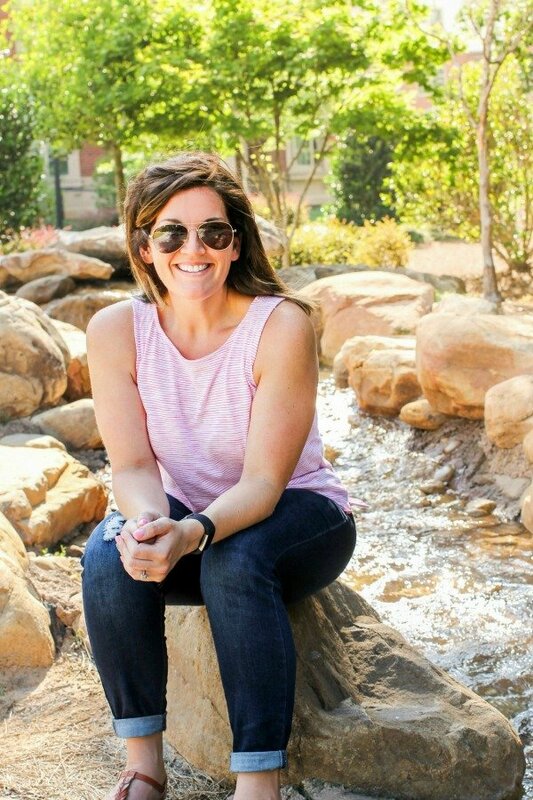 September 20, 2017 By Allyson 13 Comments This post may contain affiliate links. Read my disclosure policy. 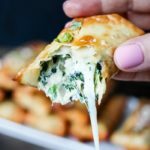 Your favorite Creamy Spinach Artichoke Dip is stuffed into egg roll wrappers and quickly fried to make these mouthwatering Spinach Artichoke Egg Rolls! Now that football season is upon us, I wanted to share one of my FAVORITE appetizers with you….Spinach Artichoke Egg Rolls! 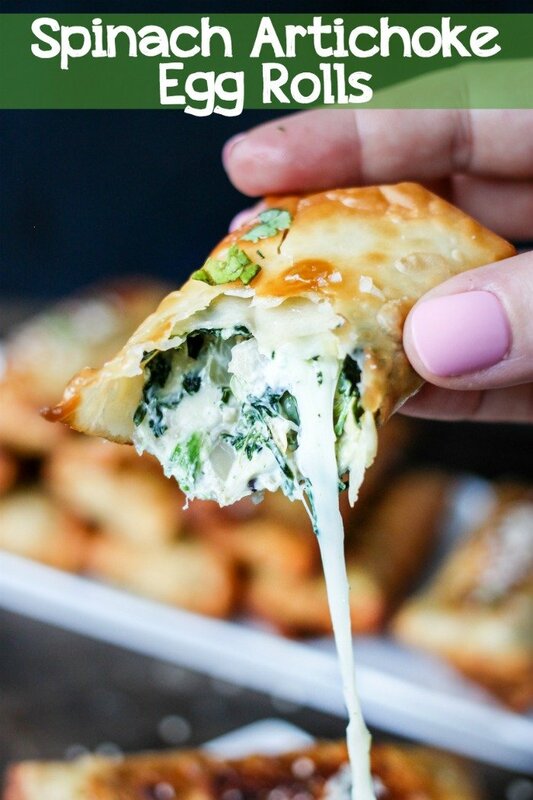 Yes, you read that right…your favorite creamy spinach artichoke dip stuffed into an egg roll wrapper and quickly friend into ooey-gooey egg roll perfection. You HAVE to try these! Big shout out to Lava Soap for sponsoring this post, all opinion as always, are my own. 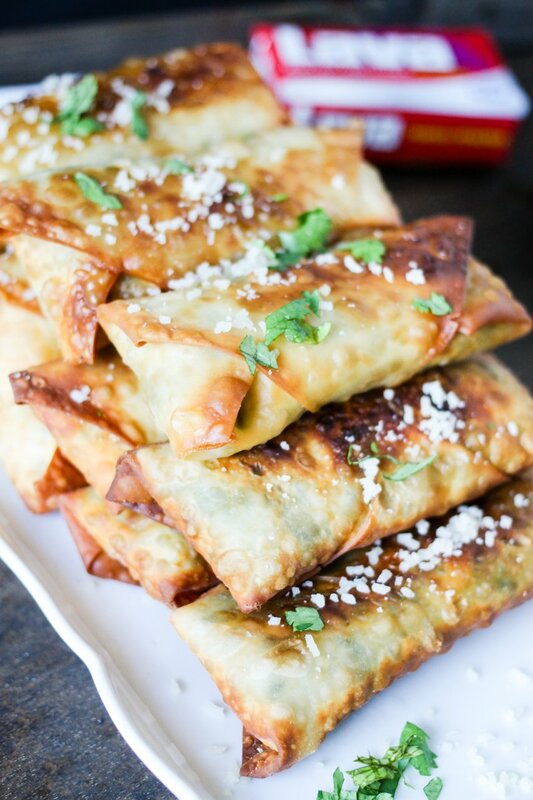 Now, I’m seriously telling you that these Spinach Artichoke Egg Rolls are the BEST game day appetizer. 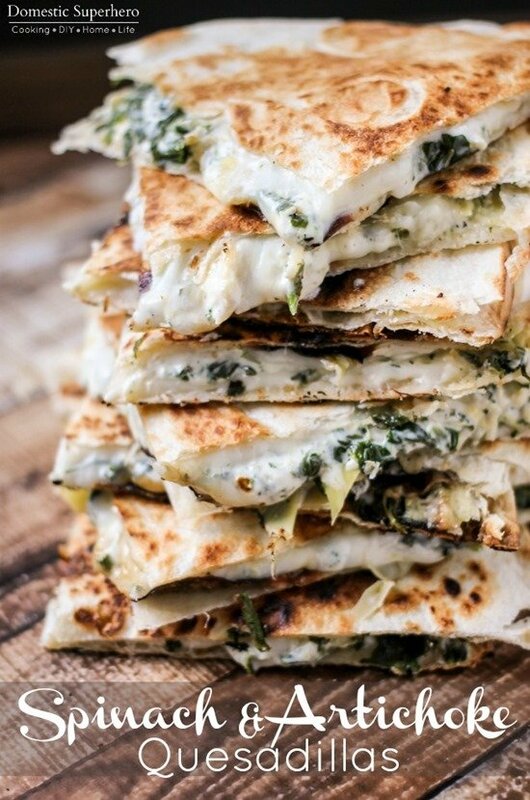 They’re creamy, cheesy, and full of delicious spinach artichoke dip that everyone goes insane over. 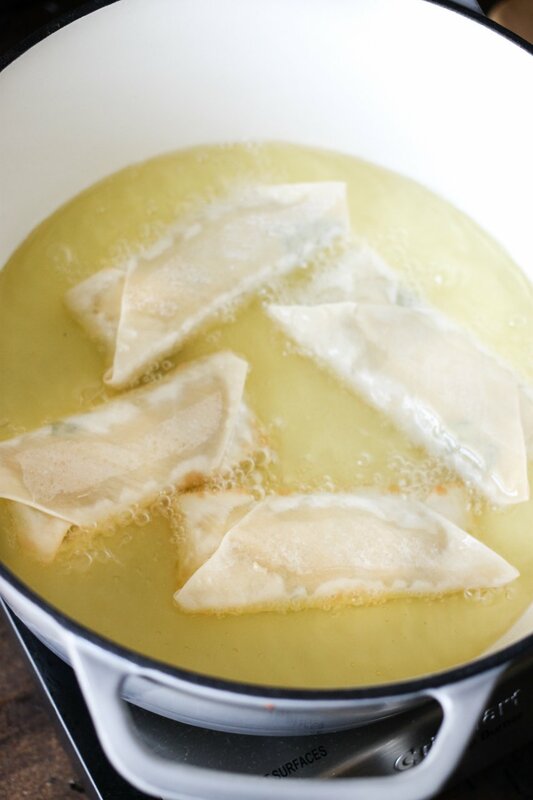 It’s SUPER easy wrapping this dip up in the egg roll shell and quickly frying it. I hate how my hands always get oil on them though, which is why I chose to keep Lava Soap on hand to quickly remove it. I always keep a bar by my sink and use it with warm water to take off everything from oil to jalapeno residue to paint…a little goes a long way (and works to remove pretty much everything!). 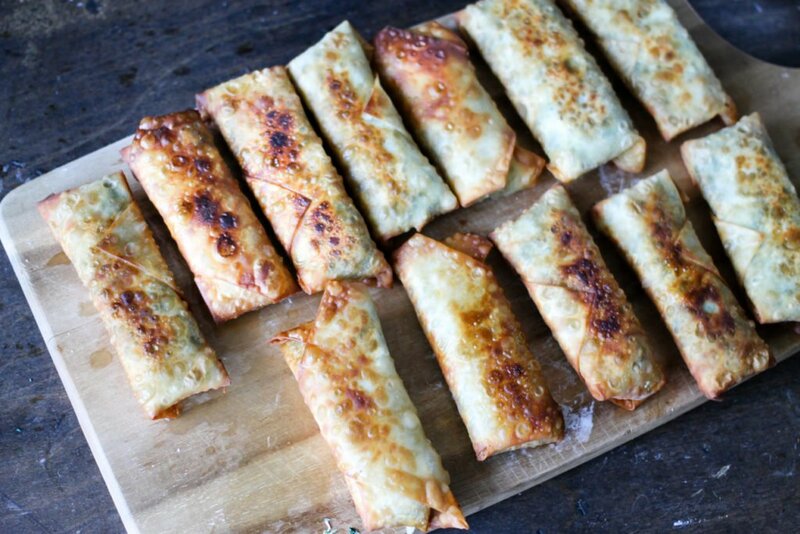 To whip up these Spinach Artichoke Egg Rolls, first make your dip…. Next, roll up the dip in the center of an egg roll wrapper (see how to video below), sing water to seal the edges. Then pop these into about 2 inches of vegetable oil and fry a few minutes per side, or until golden brown. I like to fry about 4 at a time because you need to let them have some room to cook. You definitely don’t want to crowd the pot and risk the egg rolls busting open…that would be tragic. I let them rest on a cutting board for a few minutes while I was frying up the rest of the Spinach Artichoke Egg Rolls. You could also line it with paper towels to absorb the little bit of grease. Then I just pile them up on a serving dish and sprinkle some parmesan cheese and parsley over the top! Voila! 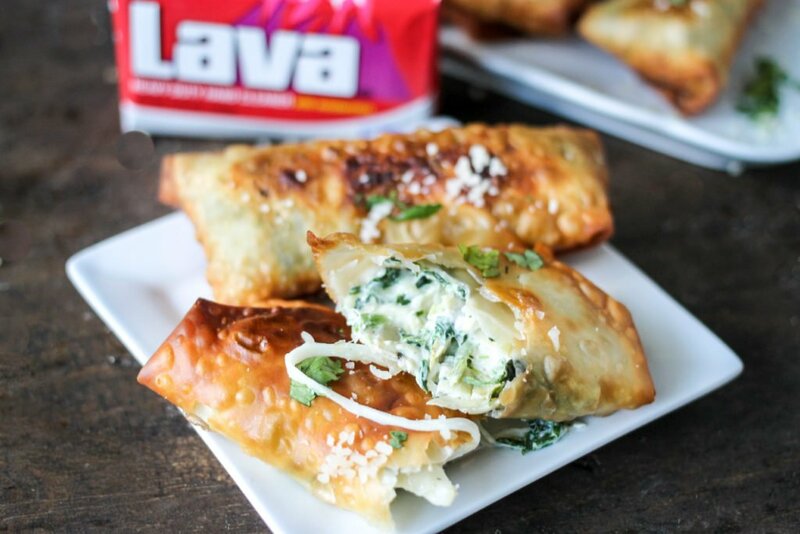 After I am finished cooking the Spinach Artichoke Egg Rolls, I wash my hands immediately with Lava Soap. I love Lava Soap because it really gets EVERYTHING off your hands. You don’t have to worry about any greasy oil being left anywhere on your skin. I like to order my soap off Amazon, but they sell it in stores as well! 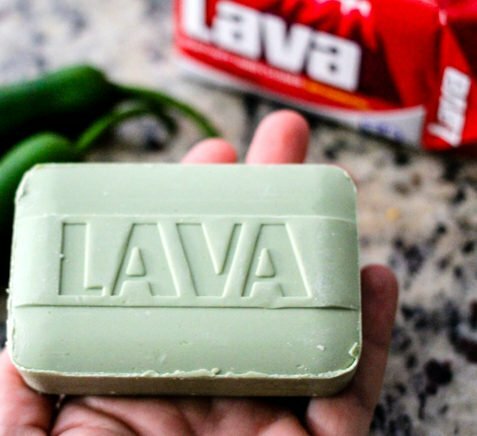 You can even use Lava Soap outside of the kitchen; it’s great for getting grime, grease, paint, ink, glue and much more off your hands. We keep them all around our house, but especially in the kitchen and in our mud room where I wash my hands after doing dirty work around the house and garage. I love it! 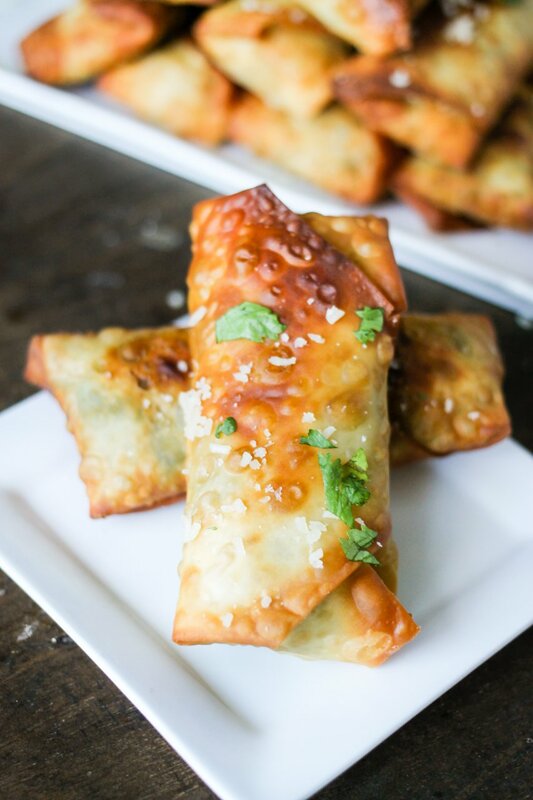 Serve these Spinach Artichoke Egg Rolls on game day, at a pot luck, girls night out alongside a delicious cocktail, birthday party, or whenever! 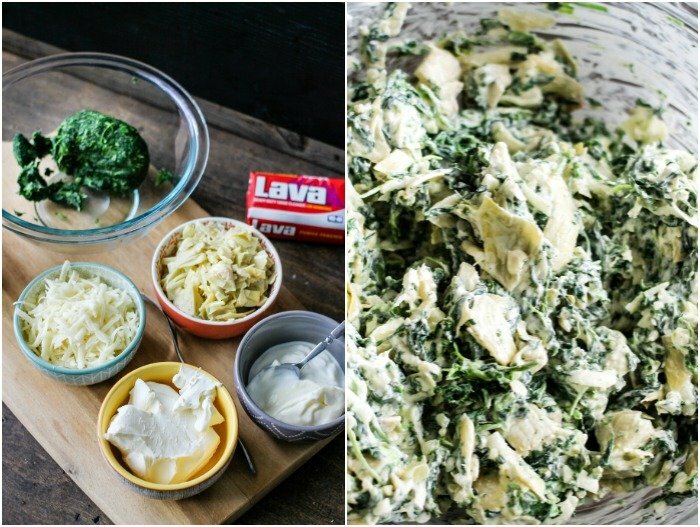 In a large bowl add spinach, artichoke hearts, cream cheese, mozzarella, sour cream/greek yogurt, mayonnaise, garlic, pepper, and salt; using a fork mix thoroughly to combine. Place oil into a dutch oven or heavy bottom skillet; heat over medium to warm oil. Place 4 egg rolls carefully into the hot oil. Fry for 2-3 minutes or until golden brown, then carfully flip over and cook 1-2 more minutes or until golden brown. Remove and set aside. Repeat for all spinach artichoke egg rolls. Place on a serving dish, then top with grated parmesan cheese and parsley. Serve warm and watch disappear! Bang Bang Shrimp Quesadillas are the perfect meal or appetizer! Shrimp, sweet & spicy bang bang sauce, cheese, and slaw all grilled between tortillas is so delicious! Genius idea!! my favorite dip in an egg rool!!! OMG! Those look so good! This is such a great idea! 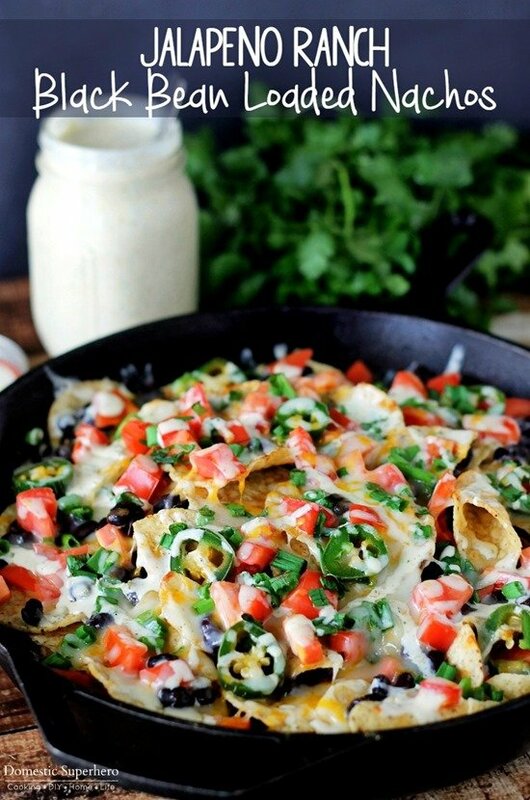 We always run out of dip before eating all the chips so this solves that problem. AMAZING!! I’m going to be dreaming about these until I can make them! Love eating spin dip, and I never thought about putting it in an egg roll! Love this ! Yummy! These rolls look great! 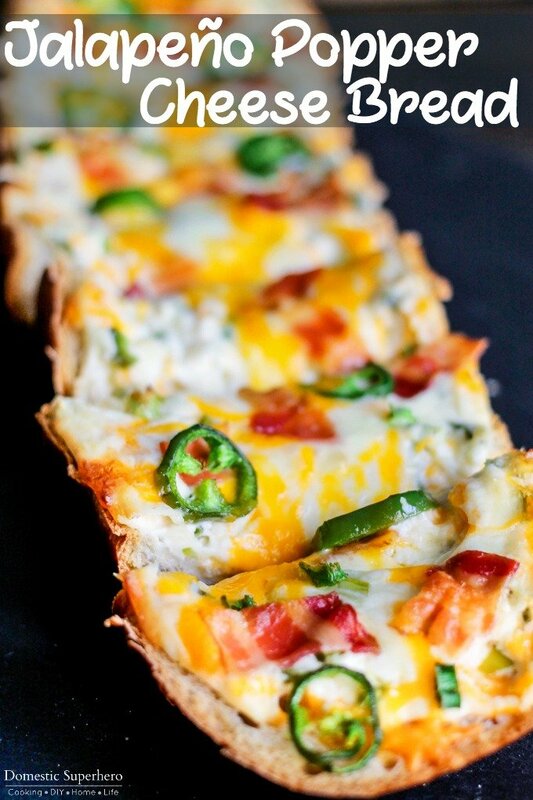 These are a great addition to your game day recipes! Cindy – I haven’t tried baking these so I can’t be sure! Please let me know if you try it out and how it goes! These look amazing. I just might serve these up at my holiday get together. Laura- I have’t tried that so I am not 100% sure…but I THINK it would be okay. If you could, I’d probably recommend making them but not frying them. Then frying when you are ready to eat. Let me know..